DEMENTIA - What is Dementia? Memory loss – The individual may repeat questions or statements, misplace things or lose items, forget names of others, forget appointments or to take medications/pay bills. The person may begin to forget recent events with progression to forgetting events/people/history from longer ago. The individual may show increasing forgetfulness and disorientation (person, place, time). Learning new ideas/tasks and remembering new information is often difficult. Difficulty with understanding language and/or using language – The individual usually displays decreased ability to write or speak. Sometimes the person may not be able to “find” the right word to use in a sentence. They may substitute any word or may wait for someone to assist them or “fill the spot” with an appropriate word. Terms often associated with language deficits may include: word-finding problems, echolalia, confabulation and preservation. Motor skills may become impaired – The individual may experience difficulty with movement, especially fine coordination and control of the hands and arms. If the individual does show signs of in-coordination and lack of control with movement, deficits may be seen in dressing tasks, eating, writing, opening and closing small/tight containers, etc. Sometimes, a person’s brain doesn't always tell the hands/body what to do and this can lead to problems as discussed above as well as difficulty with walking, balance, and planning movements. Executive functions/Cognitive and perceptual skills decline – The individual may show problems with judgment, reasoning, problem-solving and planning. Often the person loses the ability to think abstractly and requires concrete or specific messages. A person may require assistance to plan more unfamiliar tasks and organize things to ensure safety/thoroughness. A person with dementia may begin to lose insight regarding consequences of certain actions or non-actions. Mathematical skills often show decline due to attention and concentration as well as the above, making it more difficult to do finances, shopping, money management without assistance. Learning new skills is usually difficult. Familiar, repetitive tasks are often performed more accurately and appropriately for longer periods from the onset of the disease. Emotional/personality changes may appear -- An individual may show decreased awareness of or an inability to recognize stimuli (and at other times an emotional response is likely due to the person’s awareness of the “changes” going on in and around them). There are many behaviors that can be associated with the above including: irritability, anxiety, depression, aggression, withdrawal, paranoia, new/increased confusion, incontinence, and/or changes in personal hygiene, sleep or sexual activity. Before age 65, less than ½ to 1% are affected (and of those, it is more commonly due to head injuries, although Alzheimer Disease can occur before age 65). 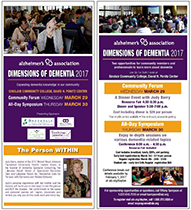 * After 65, prevalence of dementia increases to about 5-10% of the population. * After 75, the rate increases to 18-20% of the population. * After age 85, the rate goes up to 35-40% (some estimates go as high as 50%). * After age 65, 50-70% of the dementia cases are thought to be caused by Alzheimer’s disease. These low percentages translate into a high number of people with dementia. 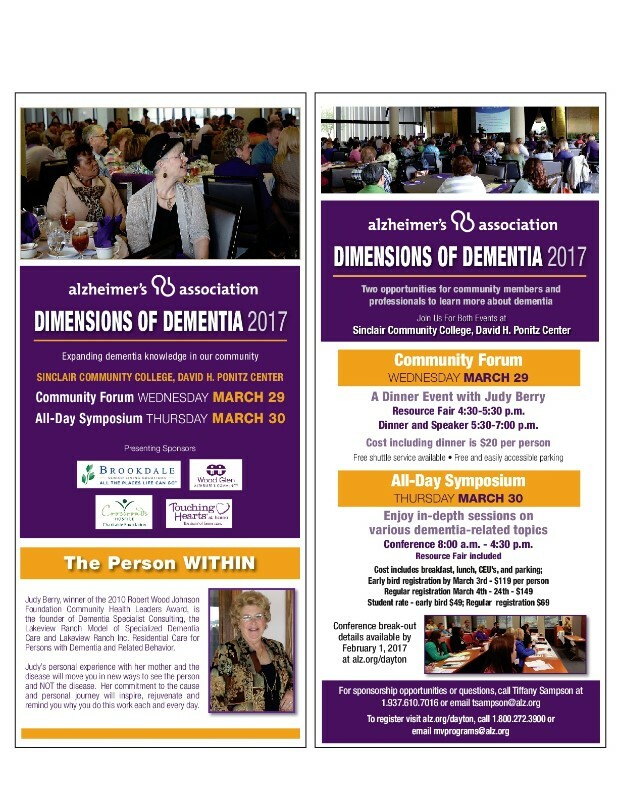 Currently, approximately 4.5 million people in the U.S.. have Alzheimer’s (the most common form of later life dementia). This is likely to increase as the population continues to age. WHAT IF IT IS DEMENTIA? What is the cause of the symptoms? HOW DO I TALK TO A PERSON WITH DEMENTIA? Communication involves both the sending of messages to others (production) and the understanding of messages sent by others (comprehension). Communication includes not only the words we use, but also our tone and body language.